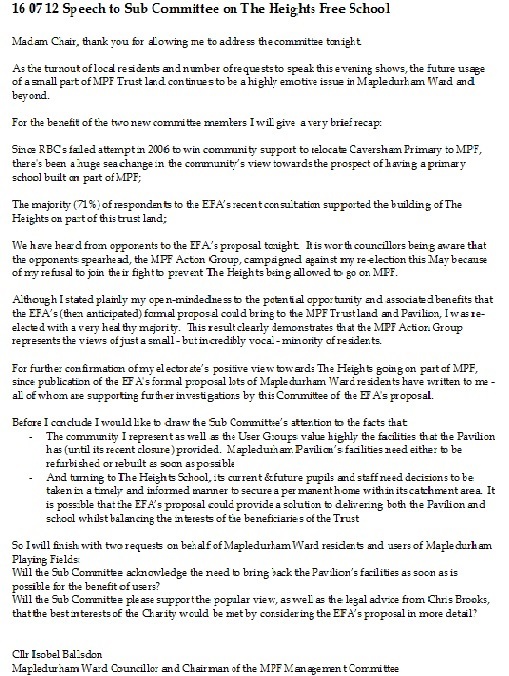 At last night's "The Heights Free School Sub-Committee" meeting a decision was taken to investigate further the EFA’s proposal to purchase a leasehold interest of a small portion of Mapledurham Playing Fields (MPF) on which to build a permanent home for The Heights primary school. The whole meeting was recorded on RBC’s webcast and can be viewed here. Over 30 questions from the public had been tabled but there was only time for 11 of these to be put to the committee within the allotted half hour time slot. Residents used their democratic right to grill the new chair, Cllr Debs Edwards, on many aspects of the proposal and how her committee was going to conduct itself. Cllr Edwards answered the questions, sometimes deferring to the legal advice provided by Chris Brooks, RBC’s Head of Legal, sat next to her. This was followed [at about 32 minutes in] with five minutes “in favour” of the EFA’s proposal split between Dan Pagella (a Trustee of The Heights) and Kerry Parr (a parent of The Heights); five minutes “against” from Martin Brommell (chair of the MPF Action Group) and finally a speech from me on behalf of Mapledurham Ward residents and Users of MPF. 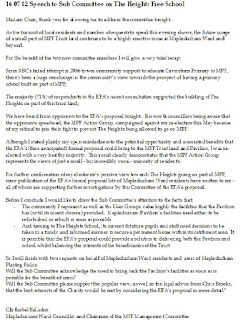 A synopsis of which is: I declared that the majority of my community is supportive of The Heights going on a small part of MPF; that the MPF Action Group campaigned unsuccessfully against my re-election because I refused to join their fight against the school going on MPF; that MPF Action Group represents only a small minority of the community (otherwise I would not have been re-elected because of remaining open-minded about the EFA’s proposal’s potential benefits to the MPF Trust). On behalf of Mapledurham Ward residents and MPF users I asked the Sub-Committee to acknowledge the need to bring back the Pavilion’s facilities as soon as is possible; and to please support the popular view as well as the legal advice of Chris Brooks, that the best interests of the Charity would be met by considering the EFA’s proposal in more detail. The Committee then asked questions of Mr Brooks and put their views to Cllr Edwards [at about 37 minutes in]. This enabled Mr Brooks to inform the committee of the answer to one of the unasked questions (tabled by Robin Bentham, WADRA’s chairman) which essentially asked whether the listing as an Asset of Community Value of the Pavilion together with its entrance and car park could prevent the EFA from buying a landlocked part of MPF. Mr Brooks informed the committee that this would not impact on the future use of the land as a Free School. The meeting finished with a recorded vote, with all members deciding to support the EFA’s proposal being further investigated. * Since posting the above account I was contacted by Mr Brooks. Having considered his statement (quoted above) he has informed me that he should have been more specific and not added the reference to the beneficiaries. I am happy to clarify the legal point at his request that the Trustees act in the best interests of the Charity.